It’s a hard time to turn pro. The reduction in team sizes for 2018 means recruitment has been under pressure, especially for teams without obvious development programmes but 30 neo-pros have joined the World Tour. Teams are scouring the world for new talent, the likes of Quick Step are no longer automatic homes for the best Flemish talent as the team signs neo-pros from Colombian and Ecuador these days. Here are some names which might be new for you today but hopefully they’re more familiar by the end of the season. Benoît Cosnefroy is the reigning U23 champion which seems as good a place as any to start. Technically he’s been a pro with Ag2r La Mondiale since August last year and he won the 1.1 GP d’Isbergues a week before winning in Bergen. The Worlds was his first big title after a string of second places in the French and European championships to the point where when he and Lennard Kämna made it into the finishing straight in Bergen last autumn the German seemed the default pick. He’s a versatile rider with a background in cyclocross but it’s up to him to shine in the pro ranks, several French riders have won the rainbow jersey but had different career paths, Romain Sicard (2008) and Kevin Ledanois (2015) haven’t won a pro race between them while Arnaud Démare (2011) has flourished. Bjorg Lambrecht has already been in the news because of an admin hiccup by the UCI where he wasn’t included in the Registered Testing Pool, the list of athletes to monitor, in time for the Tour Down Under so all he could do Down Under was train in the sun (pictured). Ironically he wasn’t supposed to be there either, the original plan was to turn pro mid-way with Lotto-Soudal during 2018 but brought this forward. And why not? He was second in the Tour de l’Avenir and to some extend a moral winner given Bernal was a salaried pro who’d enjoyed the best part of two seasons banking pro races in his legs before going back to the “tour of the future”. He racked up a lot of second places last year but all in prestigious races and took the U23 Liège-Bastogne-Liège which is held on a different course to the pro version and requires more race craft. Many Belgians thrive in the U23 stage races only to go quiet in the pro ranks and Lambrecht is unlikely to be the new Merckx. But with his attacking style and small build he could be the next Lucian Van Impe. Australia’s Lucas Hamilton – no relation to talented compatriot Chris Hamilton over at Sunweb – has joined Mitchelton-Scott on a three year deal rather than the standard two year pact, presumably a sign that the Aussie team wants to hold onto Hamilton for as long as possible. No wonder, he was second in the U23 Giro and won the time trial stage among other wins and placings in the year. He can’t go in the deep end yet so don’t expect storming results, he’s more likely to learn how to become a valuable stage race helper for the Yates brothers and Esteban Chaves before moving onto take his own chances. What type of rider is Neilson Powless? 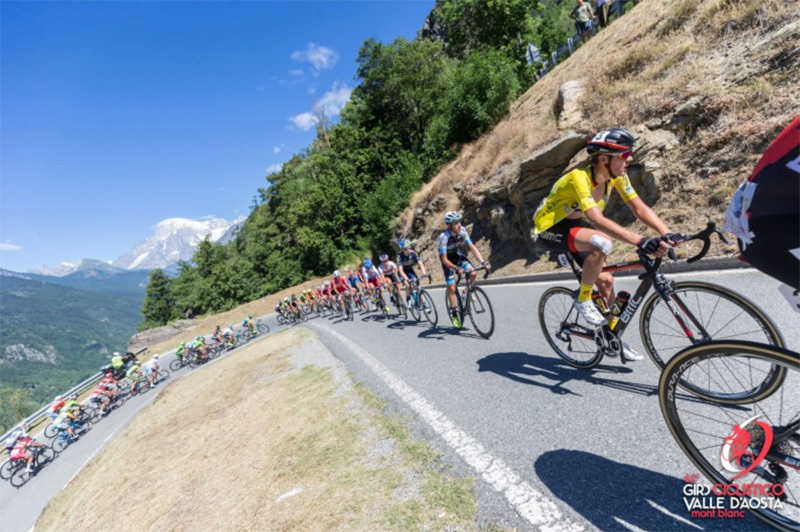 The Californian won the final stage of the 2016 Tour de l’Avenir ahead of Lucas Hamilton and David Gaudu, a top-10 of a who’s-who of climbing promise. He slipped the field to win the opening stage of the U23 Giro last year, is the reigning USA U23 champion and can sprint well out of a small group. He was the best young rider in the Tour of California too (pictured, left). So it’ll be interesting to see what type of rider he becomes with Lotto-Jumbo where he takes the spot of house American after Alexey Vermeulen’s contract wasn’t renewed and only after the financial debacle at Cannondale-Drapac last year, he was supposed to board the Argyll Armada but the contract never came and so he switched to the Dutch team. He’s a relative newcomer to the sport and while others above and below perhaps knew how to ride in a crosswind from childhood Powless has only been road racing at a top level since 2015 having switched from a focus on triathlon in his junior days. Who’s the fastest sprinter in the Netherlands? Dylan Groenewegen for now but Fabio Jakobsen could be the next in line and Quick Step have signed him for 2018 and beyond and if he’s not identical to Groenewegen he’s a good body double. Another sprinter chez Quick Step? The Belgian team has Fernando Gaviria as their lead sprinter and signed Elia Viviani too but it seems they have plans for the future too with Jakobsen who enjoyed consistent high level U23 sprint wins last year. But that’s not all, the team has signed Colombian sprinter Alvaro Hodeg too, a sprint stage winner of the Tour de l’Avenir last year but without any other big wins. Instead his backstory is interesting, according to El Espectador he’s great-grandson of an emigrant Scottish fisherman, his grandfather was a cowboy and his mother is from Lebanon. He grew up at ease on a BMX as well as rounding up livestock on a horse, raced on the track and has flourished since. Since we’re on Quick Step, Ecuador’s Jhonatan Narvaez is another to watch. Nature or nurture? They often go together and Pavel Sivakov is the son of Aleksandra Koliaseva, a national and world champion and ex-pro Alexei Sivakov who rode the Tour de France several times for French squad Big-Mat around the turn of the century which suggests premium DNA. Not for him an upbringing in Smolensk or Siberia, instead he grew up in South-Western France and if he rides under a Russian flag he’s fluent in French and speaks excellent English too. He was the best U23 stage racer last year, a title that’s usually up for debate but given he won Ronde de l’Isard, the U23 Giro, the Giro Ciclistico della Valle d’Aosta Mont Blanc there’s not much nuance. It pro cycling had an annual draft he’d be atop most people’s list. Even when things went wrong they worked out, he cracked on the first mountain stage of the Tour de l’Avenir saying the rest day didn’t work out for him but duly won the last mountain stage and there were more big wins too. Plenty of success in the mountains and he time trials well too and with his tall, lean build he looks like the prototype stage racer and Team Sky poached him from BMC Racing. He’s still 20 years old too and is the youngest of all the neo-pros being born in July 1997. Niklas Eg is from Herning in Denmark, the same city as Bjarne Riis. Indeed he’s been riding for Riis’s Team Virtu Cycling and certainly not as a local make-weight. For starters he’s stick thin, the build of a climber in the mould of Romain Bardet or Ilnur Zakarin and especially because of his results, third overall in the Tour de l’Avenir and fourth in the Valle d’Aosta and was part of the Danish super team that dominated the 2014 junior Peace Race alongside Søren Kragh Andersen and Mads Pedersen. Now Eg joins Pedersen at Trek-Segafredo and given the team missed out on a big GC signing this year he might find a few more opportunities on mountain stages this year. Belarussian Alexandr Riabushenko turns pro with UAE Emirates after two seasons with the Palazzago U23 team in Italy that has seen the likes of his new team mate Fabio Aru pass through its ranks and whose manager Olivano Locatelli has taken many an Eastern European rider into the pro ranks. His name is almost a Slavic derivative of “robust” and it’s fitting given he’s proved a tough rider on tough courses, especially with an uphill finish. The European champion in 2016 (pictured, Cosnefroy collecting one of his infamous second places) he seems to fit in between Diego Ulissi and Ben Swift for the uphill sprints and could deliver results early as he looks the finished product. Thank you for a great read, as always. Looks like Kevin Ledanois’ name is missing right after Romain Socard’s. I’m noticing in all these neo-pro articles around the net that writers are picking and choosing which Sky riders they feature. Here Sivakov is chosen and Egan Bernal and Halvorsen are left out. Had they gone to other teams one imagines they’d have warranted a mention. Blame the Murdoch (I mean Disney) dollar, I suppose. No doubt all to be resolved when Froome gets a ban, Sky fire him, Disney fold the team and Sky cease to exist. Sorry, I must be dreaming someone else’s dreams there. Bernal isn’t a neo-pro. Halvorsen was in a Continental team last year (but so did Powless, Hamilton, Narvhaez and Eg, so I guess that makes him a neo-pro nonetheless). His best year was 2016 however, he was well-known already and he’s not considered as “neo-neo”, I imagine. That’s right and I can’t cover every Sky rider. We’ll see with Halvorsen, is he a sprinter or Thor Hushovd 2.0? He is a neo-pro under the UCI definition. Don’t let facts get in the way of a good conspiracy theory. Press on regardless. Yes I was going to mention Scott Davies – definitely one to watch – he also slipped the sky train after riding for wiggins – good for him and good luck to him. Di Data now have British senior and under-23 TT champs. Any thoughts on equal prize money for the Womens TDU? I know you deal more specifically with men’s racing, but is this the start of a good thing? Apologies – could not find an appropriate post. It’s great but prize money in cycling is one thing, salaries are another and it’s wages where normally the men earn a living. Maybe the women’s peloton will have a different system where they become more dependent on prize money. Perhaps the real change will be the Women’s World Tour reform that is coming but until then races can do what they can and the prize money boost is within their grasp. It’s a play for Women’s WorldTour status. The SA state government can read the tea leaves, WorldTour-style mandatory participation is coming before long and they want to be part of it. Then the ASO tool, aka Lappartient, tries to claim it for the UCI as a showing their commitment to womens cycling… despite having quite litteraly nothing to do with th decision. It’s related to popularity/numbers of fans watching given sport. The other piece of the Hodeg family lineage is that his great grandfather almost certainly had the surname of Hodge. “House American” not a promising position. Mikkel Bjerg joins Axeon Hagens Berman which goes to the rank of pro-conti from 2018. He beat the Danish hour record by riding 52,311 m – Yep, that was the 5th fastest time ever ridden at the time. Wiggins, Zirbel, Dowsett and Dennis were faster. The guy is 18. Afterwards he said it wasn’t really hard and how he’s looking forward to adding more metres next year. That’s the spirit! A good pick, riders can have great performances in road races where tactics and some luck can help but a TT ride like suggests raw talent. Oh also, Toft and Bjerg finished 1st and 2nd on Chrono des Nations last year… Serious tempo guys, these two. An now Mikkel Bjerg is mentioned, his name means “Mountain” btw. Makes sense now, thanks (will save this for quips about wooden legs etc). What are your thoughts on James Knox of Quick-Step? Bjorg Lambrecht had a great race at the Great Ocean Road race yesterday. He finished 19th with the main bunch.